Back in September, I detailed my 2016 ordeal with throat cancer and subsequent path to a (fingers crossed) cancer-free recovery in a Screw Cancer and the Sugar It Rode In On blog post on our Foreword Reviews website. Within just a few days, more than 50,000 people read the blog, and based on the slew of emails that arrived in my inbox, readers were mostly interested in my particular approach to ketogenic dieting and The Metabolic Approach to Cancer, the book that completely revamped my life. In fact, I’d go so far as to credit the book with saving my life—by helping me understand why the disease chose me, as well as providing me with the tools to stay cancer free indefinitely. 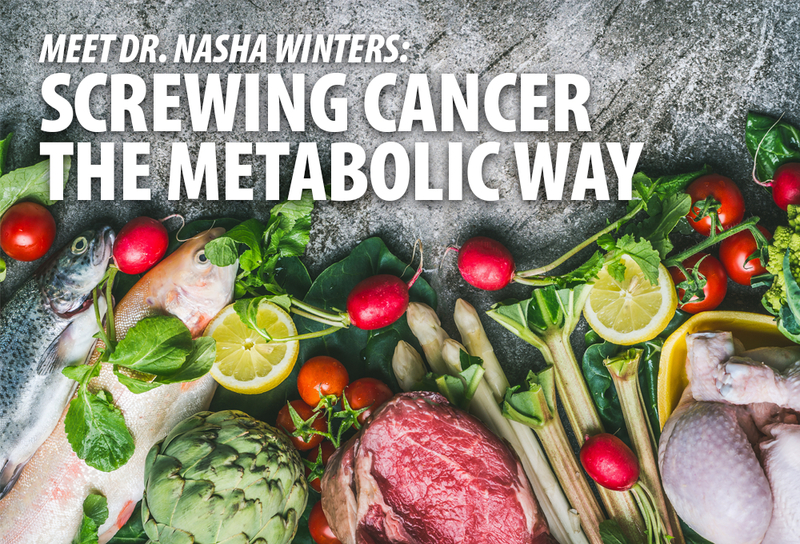 To my great surprise, one of those emails arrived from Dr. Nasha Winters, coauthor of The Metabolic Approach (along with Jess Higgins Kelley). In a quick back and forth, Dr. Winters agreed to answer a few questions via email. As our readership is mainly librarians, booksellers, publishers, and avid book readers—and not cancer survivors—we decided to concentrate the discussion on cancer prevention. So, Doc, let’s do this? Love the prevention approach. And, recall, that if you are an American and a male, you will have a 1 in 2 chance of getting cancer in your lifetime; and females, a 1 in 2.4 chance—so no matter the vocation, this information is important to share with the masses. When I was first diagnosed, I remember the initial shock: holy cow, I didn’t see this coming. It was a feeling I wouldn’t wish on anyone. But with the prevalence of cancer nowadays, everyone needs to be in a proactive, cancer-fighting mode at all times. Anyway, I know you’d agree that it’s hugely important just to get people thinking about the disease, to understand it a bit better, but also to keep it in perspective. First of all, can you address those unhealthy types who think it’s too late to do anything? Believe it or not, 99 percent of the time, my clients say to me, “I was healthy until I got cancer.” That simply isn’t true. I have been in private practice for over twenty years and while still in clinical rotations and running a general family practice, I often ran annual labs and did a comprehensive physical. What I found was shocking. Most folks didn’t know they were diabetic, hypothyroid, peri-menopausal, harboring elevated viral markers, low D3, osteopenia/porototic, high blood pressure, kidney disease (like protein in the urine and other inflammatory cells), et cetera. We are all like lobsters heating up in a pot of water set to boil—-we don’t know we are in trouble until the water has reached full boil. My mission has been to help folks feel the simmer long before the burn. 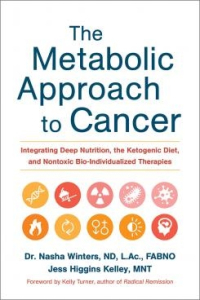 This Metabolic Approach to Cancer was born of the need to get information out there (given the statistics) and to have a reference for patients and providers. The information in the book is a culmination and collection of 25+ years of my clinical work, research, and personal journey—it came from hundreds of thousands of hours of study from thousands of resources, colleagues, mentors, references, experiences, trial and error, pattern recognition, et cetera. I have looked for a book like this for myself for over two decades and finally decided to write it. This question may force you to theorize a bit, but can you talk about why you think the incidence of cancer has spiked in the last few decades? Increase in sugar from an average of 5 pounds per person per year (that includes honey, fruit, grains, potatoes, etc.) in the mid 1850s to an average of 175 pounds per person today. The biggest change was after the industrial food revolution, but also when the milling industry took off in the mid 1800’s. We began milling flour and really increased our carbohydrate intake at that time—-long before cane sugar and high fructose corn syrup started sneaking into our food system. Post-Industrial Food/Agricultural practices, which ties in to the previous two. As my co-author, Jess Higgins-Kelley, MNT, points out, CAFO (Concentrated Animal Feeding Operations) animal food sources are simply four-legged superfund sites. These animals are fed glyphosate drenched foods, crammed into high stress, poor-hygiene environments, and exposed to a polypharmacy of vaccines, antibiotics, and hormones. We find their antibiotics in us after ingesting such meat and it has been long understood that certain animal-based antibiotics are used to fatten the animals leading to our own expanding waistlines and increased risk of associated disease. The animal waste runs into our water supply and soil and there is likely no place left on the planet that is without residue of these chemicals, pharmaceuticals, pesticides, herbicides, fungicides, and erosion of our mineral-rich top soil. We are increasingly overfed and undernourished and sadly, there doesn’t seem to be much change happening on a global level to reverse this. So you must start locally: grow your own food, join a CSA, get to know and support your local farmers and ranchers. Become aware of what you put on, in, and around your body and home at all times. You have to take matters into your own hands as, unfortunately, our government and health care system is influenced by big corporations, and that includes Big Ag and Big Pharma who make a lot of money on keeping us sick and unaware. Aside from eating lots of vegetables, good fats, protein, et cetera, do you recommend that your patients take supplements? If so, which ones and why? There are six main nutrients I see depleted in all patients with cancer and chronic illness: Vitamins D3, K2, and B12, and the minerals Zinc, Selenium, and Magnesium. We can see a lot of this on a simple CBC with diff and CMP test but it should be mandatory for folks to run their D3 levels each year. Studies have shown if we simply optimize our levels of these nutrients, we could cut the risk of chronic illness by up to 70 percent. 70 percent!!! How is this not a thing? We even have the Vitamin D Council as part of the NIH which continues to do extensive research, and yet we are not giving this inexpensive and effective hormone-like regulating nutrient enough lip service. If folks have been on a low-fat kick for years, then they are for sure lacking sufficient levels of D3 and K2. If folks have been leaning more towards vegan or vegetarian diets or have severe leaky gut, then they are deficient in all these nutrients. Eating some organic, pastured-grass fed, and finished butter each day will get you a lot of D3, K2, and B12, and growing your own veggies in amended soil can help you get in your minerals along with pumpkin seeds, Brazil nuts, and avocado (notice fat is an ongoing theme here). For people with good health and no personal history of cancer, what five things can they do to improve their odds of avoiding the disease? First of all, I want them to prove to me that they are, in fact, healthy. Why wait? Get the following tests run and work with a naturopathic or Functional Medicine Doctor to help you truly assess the results, and remember that labs are based on the average of the population (and, at last count, half of us are poised to have cancer in our life time, so those labs are a bit skewed). CBC with diff, CMP, Vitamin D3 (25-OH), CRP, Homocysteine, TSH, Total T4, Free T3, T3 Uptake, Thyroid Antibodies, HbA1C, Fasting insulin, Lipid panel (focus here on the triglycerides and HDL, not the overall Cholesterol or LDL). That lab panel gives me a thorough look under the hood and I can tell someone in an instant if they are, in fact, healthy. And if they aren’t, we now know WHAT is off and how to address it. My mantra is “Test, Assess, Address”—that would be THE most important first step in avoiding becoming a statistic. I challenge my friends and colleagues to this set of labs regularly and they are always “shocked” when they see what a hot mess they really are. Our bodies are incredibly resilient until you have broken down enough of your energy factories (aka your mitochondria). The first SIGN that your mitochondria are struggling is fatigue—so if that is a symptom for you, dig deeper, don’t wait to be a building engulfed in flames. Also refer to those three things mentioned above: cut out/down sugar; explore what you put on, in, and around your body; and know where your food comes from. Also, get back to a natural/seasonal rhythm—screen time is just as damaging to our mitochondria as is too much sugar or too many chemicals. Preferably, no screen time or light exposure after sunset outside of candlelight or use the groovy blue blocker glasses if you face that exposure. Get on a good sleep cycle—our body does its “clean up” between 11:00 pm and 3:00 am. If you are awake during that time, you are not taking out the garbage, and, therefore, adding more burden to your body. It’s better to sleep at the front end of the night for five hours versus the latter end for eight. Example: 9:00 pm to 2:00 or 3:00 am does your body more good than 2:00 to 10:00 am. You can see that immediately on blood glucose/ketone monitors and HRV devices if you don’t believe me. Two nights of bad sleep or staying up past 11:00 pm increases insulin and insulin-like growth factor—which leads to obesity, endocrine disruption, Alzheimer’s, and cancer to name a few. Regarding the ketogenic diet, both for post-cancer maintenance and as a preventative measure, is it vitally important to stay in a constant state of ketosis for maximum benefits, or can patients also do themselves a big favor by limiting the amount of carbs/starches/sugars they eat without being 100 percent full-on keto? Just like our ancestors never stayed in ketosis for long periods of time (outside of a few months per year at any major stretch, then likely several times per week, off and on for the rest of the year), we don’t need to stay in that state for optimal health, disease fighting and prevention either. There are certain cancers and cancering processes that would do well with a longer therapeutic ketogenic state (blood levels 3-6 mmol/L) to act as a chemotherapeutic agent, or one can simply be in a nutritional ketosis state (5-3 mmol/L) to achieve a nice gentle fuel source to reboot any flailing mitochondria and enhance longevity and mental clarity. And when you become a tuned up, hybrid engine again, you will go in and out of ketosis effortlessly, like our ancestors, simply by finishing dinner at an earlier hour and not eating again for at least 12-16 hours at breakfast. You can also play with intermittent fasting and cyclical ketosis if you want to just feel into what works best for your body and be a living laboratory and know what makes your mitochondria hum. Most of us need to drastically limit/remove carbs/starches/sugar for a period of time to become fat adapted in order to gain any long term benefit, and simply skipping out a few hours per week is likely not enough for the average population. Again, working with a trained therapeutic nutritionist, keto coach, naturopathic, or functional medicine doctor is likely needed to get you safely on your way. Notice I do not say RD (Registered Dietitians) or MD. Why? Because MDs have almost no training in nutrition. Only 25 percent of all medical schools even offer an elective course and they are VERY outdated and industry-driven. And, RDs are simply paid to tow that industry-line, which is unfortunate. That is changing, however, as I have met hundreds of “recovered RDs” who have gone back to school to get the proper training in therapeutic diets and nutritional biochemistry, and are actually helping patients use food to heal. What’s happening out there in cancer research and treatment that gives you the most hope that we’re making progress, and what’s the thing that causes you the most despair? Whoa boy. Perhaps, what I have written above is enough but here is a little glimpse into how my brain sees this. We are but a bucket. Our bucket represents our mitochondria (the energy factory of our cells). Over time, that bucket accumulates stuff. That stuff can be in the form of sugar, stress, hormone imbalance, emotional baggage, toxicants, microbiome issues, thick/sticky blood, epigenetics (what was passed down multiple generations before us), inflammation, and immune dysfunction. This we have coined the Terrain Ten in the book. These ten patterns are the ingredients filling up that bucket. They can bring harm or health depending on diet, and each one impacts the whole—meaning you should test, assess, and address each one on a regular basis to make sure your bucket is overflowing with crystal clear, life-giving water instead of sludge. We are far more powerful than we are led to believe at having an impact on what goes in and out of our bucket.